“Email marketing” one of the most essential online business tool that marketers are still using to generating online leads. Although, it’s one of the oldest digital marketing techniques, but it’s still working smoothly for all types of business. According to the report (Marketing land), almost 60% of email open occurred on mobile devices (into year 2015). So, scope is much better now! In present days, there are many advanced email marketing tools (both free and pro) are available which can be helpful to get subscribers and to send promotional emails, newsletter time to time. Not only that, modern email marketing tools can also help you on choosing the proper marketing materials by analyzing your business data came from various analysing sources such as Google Analytics. So, maintaining an email marketing campaign is not a big deal in today’s advanced world. But, the most challenging part is- “writing email subject for your campaign“. Because, people will see the subject of your email first. Most of the promotional emails are simply getting ignored or marked as spam by the users without opening them. Nothing to be wondered, you can easily understand the reason behind it, if you take look at your own personal email. Tell me, how many promotional emails you have opened last month? Probably, not much! Email marketing success is totally depends on sending useful emails to the subscribers every time without disturbing them. Therefore, writing proper subjects for your promotional emails is the real challenge. And, it’s the real secret of email marketing success; I think! Here you can see that marketer is not directly offering for an instant approval of credit card. If so, then it probably ignored by the recipients. Because, it sounds scam. But instead of, he let people to check whether they are eligible for a credit card or not. Yes, it’s a thousand times more acceptable to the users. It sounds genuine, because everyone would not be eligible for the card he offerd! And it is actual rule for the credit card approval in any banking system. Think deeply, that the intention behind sending this email is not changed; he just changed the form of asking. Write the most useful part of your product/service as Email subject: Let people know about your business/products at first sight. It always make a positive impact on the users. Point-out your user’s demands and write that as your email subject. Remove Irrelevant Emails Addresses: Always send your promotional emails to the most relevant people. Otherwise there is a big chance of getting spam. If you brought email list from a third party, then you might be in trouble to distinguish between relevant and irrelevant email addresses. So, it’s better to collect email addresses from a subscription campaign run on relevant channels. What Your Competitors are saying: Make your email subject unique that it can be visible in the crowd. For that, you need to know what your competitors are saying for the same kind of email marketing campaign. It’s very easy! Get listed in your competitors email list to see what they are sending. 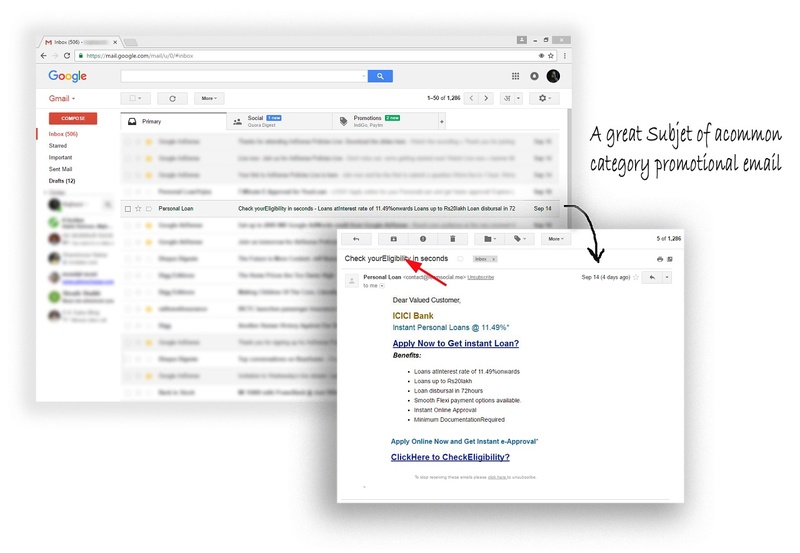 Try to Enter Into Inbox: If your subscribers grant you to sent email to them then your email will be enter into their inbox instead of junk folder. You may ask permission before sending email by implementing pop-up subscription box instead of subscription check box for spam filtering purpose. Never include heavy graphic or HTML into your emails that you can bypass the email filtering system and your emails can be take place into the inbox instead of promotional tab. Finally, I would like to say one thing that- “Marketing” is an art. It needs creativity and sharp analyzing eyes. There are several ways of convince a people. It totally depends on you and how you’re going to convince your customer without making them bore. Best of luck!